There were only ever two pools at Hove Lagoon. The smaller one was used for small rowing boats and Red Indian style canoes. It had a hut at the southwest corner from where you bought a ticket, for 30 minutes or an hour, I think, although it could have been 15 and 30minutes. The larger pool was used for small, varnished, clinker built sailing boats and motor boats. The ‘third pool’ was in fact no more than a recessed area of the main pool that was separated by a wooden walkway with hinged sections to allow the boats to be locked away in there at night. There was also a hut built onto this walkway where you bought tickets for boats on the larger pool. The boathouse for the surfing club is built over this now but the recess was identical to, and directly opposite, the one on the north side of the pool that you can still see today. The larger pool has always been used by enthusiasts for model sailing and power boats. Sunday afternoons at the western end in particular, were the most popular day for them but the small pool, too, was used by many boys with plastic hulled yatches. The larger and smaller pools were separated, then as now, by a strip of paved walkway that has a protuberance into the smaller pool about halfway along its length. On this used to sit a large brown marble drinking fountain which was removed sometime in the late 1950s early 1960s. The paddling pool is quite a recent addition to The Lagoon, I would say within the last 15 or so years. Before that there was sand pit which often smelt of dogs. The children’s swings and roundabout used to be just to the northwest of the cafe building and the pools were usually drained once a year or so to clear out the sludge. If I remember correctly, both pools are filled from the harbour by a pipe below ground. As a boy I spent many many hours at The Lagoon, or just over on either the Hove Deep Sea Anglers beach, the “First Beach” as we more commonly called it, or the “Second Beach”. From the age of seven or eight we used to go to the beach all day by ourselves in the summer. Apart from getting home covered in tar, which our Mums would take off with butter, I don’t recall anyone coming to any harm at all. Today, our parents would have been locked up for neglect. I used to fish in the lagoon, the one on the right looking out to sea. Flounders used to come in through the pipe and get trapped. Spent many a summer evening with a rod and a few mates there. It was probably around 1970’ish. 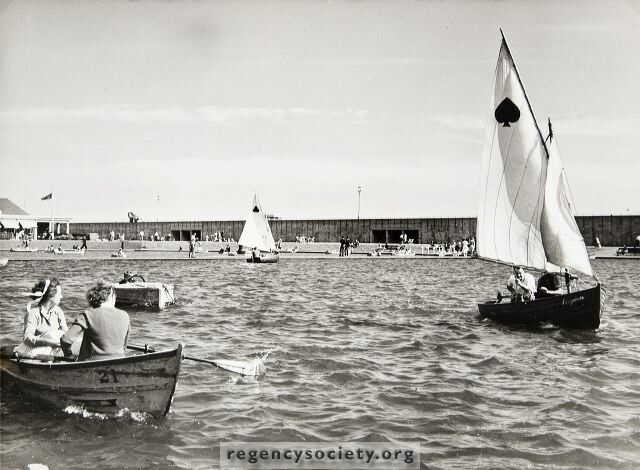 And don’t forget the Model Engineers club (whose home was in a pub next to Brighton Station) who launched both sail and powered boats on the lagoon on Sunday mornings. My father Jack made many of the tiny petrol or diesel engines used in the motor boats. This was in the mid-1950s and the latest innovation was radio-controlled sails and steering to the model yachts. Incidentally, this was the same club who operated the steam railway at the northern end of Hove Park. Memories and pictures of that would be welcome. Tim Sharman.